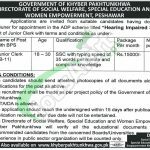 Get Jobs in Social Welfare Special Education & Women Empowerment KPK 2017 for Junior Clerk (BS-11) from this page. Applications are invited from suitable candidates having domicile of District Buner for appointment in the ADP Scheme titled “Hearing Impaired School” for a post of Junior Clerk with terms and conditions such as candidates willing to apply should hold at least Matric qualification with typing speed of 35 words per minute and computer knowledge and age should be between 18 to 30 years. The recruitment shall be made as per project policy of the Government of Khyber Pakhtunkhwa and after final selection Pay Package will be Rs. 15000/- per month. So, only eligible candidates fulfilling criteria should apply as per the following how to apply procedure given below after this paragraph. Applications along with attested copies of educational certificate, diplomas, CNIC, domicile and recent photograph should reach the following address given below. The last date for submission of application is May 18, 2017. No TA/DA is allowed. 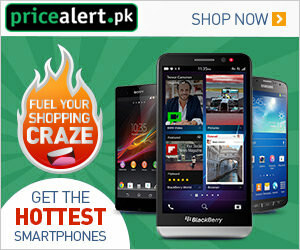 For more Government jobs please visit our site JobsAlert.pk. Address: Directorate of Social Welfare, Special Education and Women Empowerment, Peshawar.